You should have arrived here from the super talented Rubeena's blog! 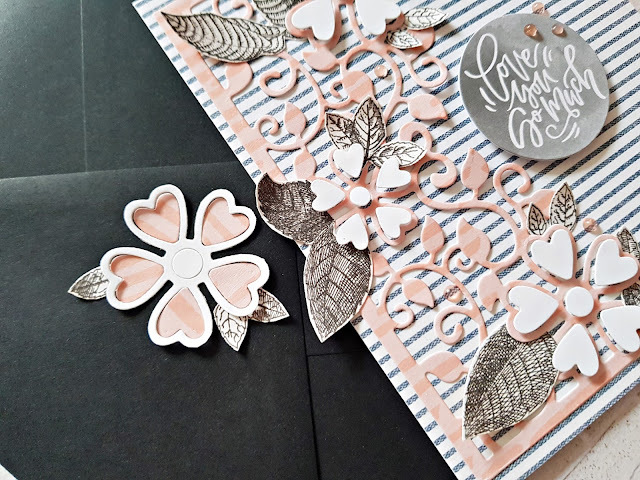 To create today's card I used a wonderful floral die from the Blooming Garden collection by Marisa Job. I die cut the shape twice, once from patterned paper and a second time from white card stock. I created an A2 size card base from white heavy weight card stock and adhered an A2 size striped patterned paper panel on the front. I then glued down the patterned paper die cut using liquid glue. Now, I prefer dimension on my cards so I added foam dots to the negative shapes in the flowers I cut from white card stock. I adhered these down. I fussy cut some black and white leaves from a patterned paper and attached them around the flowers. For my sentiment I used a die cut circle. To finish off my card I added some Nuvo Jewel Drops. I don't like to waste anything, so I thought I'd use at least a part of the white die cut shape too. I fussy cut out one of the flowers and glued it onto the flap of a black envelope. I also added in the negative shapes I had left from the patterned paper die cut. Done! I hope you like how it turned out! 1. To celebrate this release, Spellbinders is giving away a $50 gift certificate to a lucky winner. Please leave a comment on the Spellbinders blog by Sunday, April 22nd 11:59 pm EDT for a chance to win. 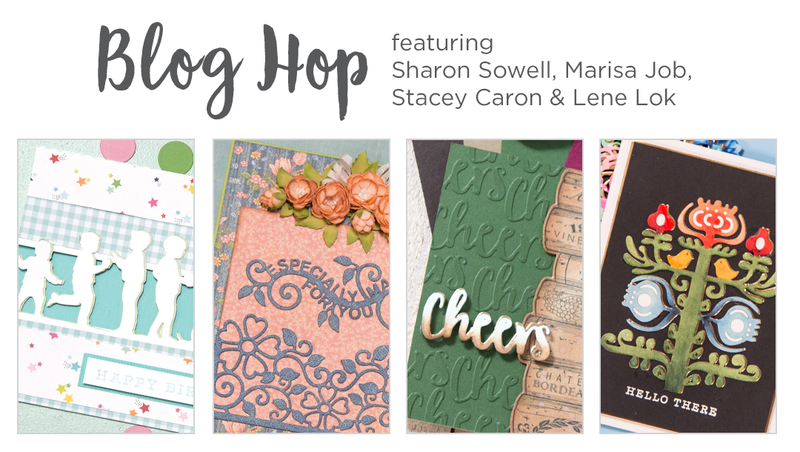 The winner will be announced in the blog hop post on the Spellbinders blog the following day. Winner is responsible for shipping cost, duties and taxes. 2. You can also win a $25 gift certificate to the Spellbinders shop right here on my blog! To be eligible please leave a comment on this post by Sunday, April 22nd 11:59 pm EDT. Easy peasy! I will announce the winner in this blog post shortly after the giveaway closes. The winner is responsible for shipping cost, duties and taxes, if applicable. Winner is Marie Siler - Please check my answer to your comment! Wow this is so lovely! I love the dies layered on the striped paper. Such a pretty effect. OMG, gorgeous! Love the muted tones of the patterned paper die cut and the negatives used to fill in spaces. Also love the matching envelope. Thank you for the creative inspiration. Very beautiful and elegant card. Love the new dies. I L*O*V*E how it turned out! Very pretty & quite elegant. I love that floral panel die you used. An exquisite card! Love it! I like your combination of papers. The leaves look so light and airy, too. What a beautiful card. THank you!!! Elegant,that is the word that comes to mind. Oh my goodness! 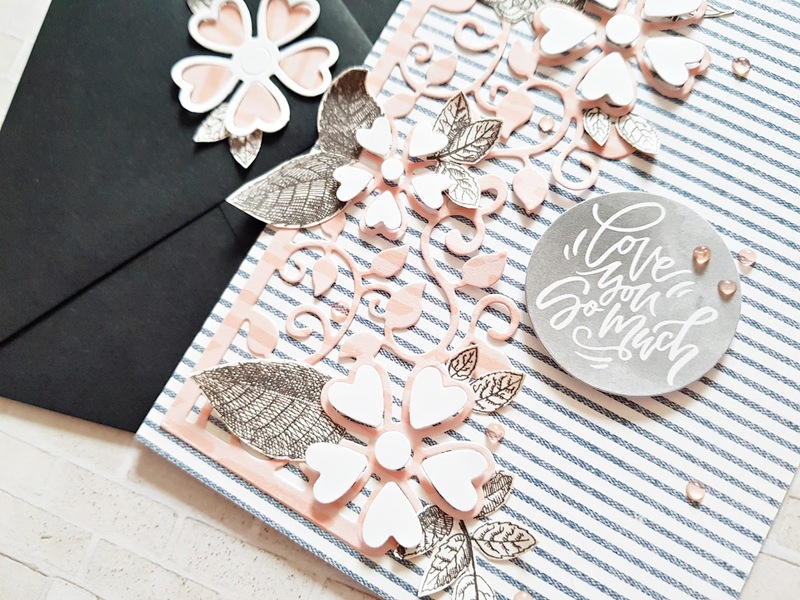 Loved this card with all the details especially the heart flowers. Thank you for sharing your talents today. Gorgeous card - love the subtle colors. Stunning! Love the color combination, the patterned papers play beautifully with each other and the leaves are amazing. (I went back to see how you did them! I doubt that I would have thought of that, but the result is perfection.) Thank you for this lovely inspiration. Pretty. Reminds me of a designer handbag for some reason. hehe that's funny! well, I do love hand bags :) Thank you! So very pretty. Love your choice of delicate colors. What a perfect way to showcase how to use negative space. Thanks for sharing. So soft & delicate looking. Any woman would be thrilled to receive this beauty. I love, love this card. I love the colors and the die and how you incorporated patterned papers as well. This is a winner! Beautiful card and matching envelope! Beautiful flowers, love the colors you used. Lovely, elegant card. Love the color combination! Your die cut blossoms look like Dogwood blossoms. They are blooming now here in Georgia. Beautiful card! I really like the stripe dimension and the black and white leaves. It all works so well together for great dimension! Love it! That is right up my alley! I love your card, so soft and pretty! What a pretty card! Love the soft pink. Very elegant. What a gorgeous card. I would love to make something like this for my mom. Gorgeous card! Fantastic color, dimension and texture. The striped paper is a fabulous backdrop. Your card is SO elegant! I love the heart shaped petals on that floral die! Beautiful color palette! I love the pink flowers with the black leaves. It's such an elegant look! Love this one! The soft colored florals against the stripes is awesome! This is a very lovely card! One of my favorite color combinations! Love you how popped some things up and not others. Very nice! Lovely card and coordinating envelope! What a Beautiful and Elegant card! Great Job! So pretty and elegant card design. 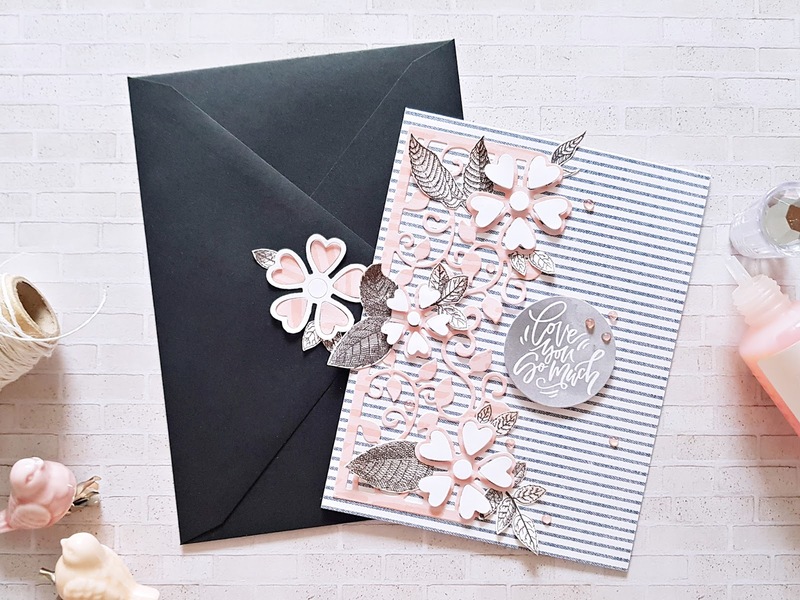 Beautiful layering on this classy card. Thanks for sharing your creativity.